Few philosophical queries have stumped scholars and great thinkers nationwide quite like "what is Guy Fieri?" We have no comparative data. He might be a chef, he might be the face of a popular television show, and he might also be a figment of your imagination. There's only one thing we know for sure: he is mayor of a place called Flavortown. The beloved TV chef and lauded creator of Donkey Sauce took to Twitter after the Midterm Election on Tuesday to announce that he was wildly grateful to the Flavortown community for electing him as their mayor for one more term. You might find yourself wondering what (and where) Flavortown actually is. This is not an unreasonable question. The answer, however, does not come from a place of logic. "On camera, I once said, 'This pizza looks like a manhole cover in Flavortown.' Willy Wonka had a chocolate stream, you know? So it's taking these iconic food items, these iconic food moments, and giving them a home," Fieri told Munchies in an interview. "They all live in Flavortown. It's like one of those things in The Matrix: You can only get down with Flavortown if you believe in Flavortown. I have people walk up to me and say, 'Hey, I'm a citizen of Flavortown.' I have people that want to pledge to be a city council member of Flavortown or the mechanic. It doesn't stop. What would be the airline of Flavortown? Sausage Airlines? It just doesn't stop. I just said it, and then people heard it. Of course, there's no Flavortown -- unless you believe in it." 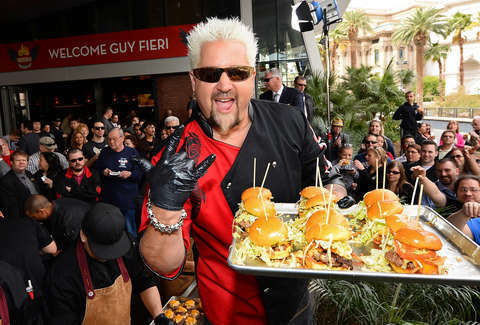 When Fieri publicized his re-election in the midst of the actual Midterm Elections in the United States of America (which is definitely a real place even if you don't believe in it) Donkey Sauce devotees and deriders took to Twitter to express their strange combination of praise, confusion, and mockery. In spite of the pushback, it seems unlikely that any votes will be recounted. With respect to the democratic process, we are now required to yield to Mr. Fieri for four more years. On the plus side, we hear the place is providing haven for political refugees. Eliza Dumais is a news writer at Thrillist who has never been to Flavortown. Follow her on Twitter.